You also can use the reinforced signal cable to avoid signal interference,if the HDMI port is behind the monitor.The monitor will show basic information:Item name ,Password,URL. Online Cast: Switch the “TuMao_x” to yourself WIFI,then you can transmitt online movie and so on. 5.Click “Airplay”;6.Select “TuMao_x” and a few seconds later Airplay is available. router and connect; 11.Then your own router name will appear on the monitor if you connect is successful. ; 12.Once again open your Airplay function.Then you can transmitt online movie and so on. 6.Minisize, lightweight, convenient for home , office and traveling. 1 * 6 Month Warranty. 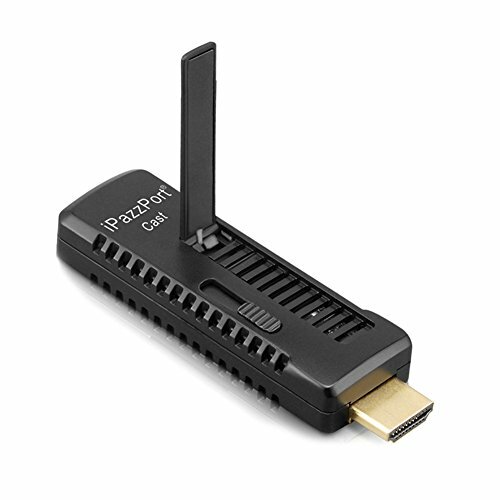 Streaming Media Player : Support HDMI 1.4 port and 1080P HD output. You can cast streaming or local pictures,music,videos,games from Iphone Ipad Android device to your big HD TV, beamer and monitor. Support multiple formats of photos, videos and files. Easy to use: No app or drivers required , plug and play. 3 steps to enjoy media on large screen: Plug->Connect->Mirroring by using Miracast, DLAN and Airplay mode. The reinforced signal cable and External WiFi antenna make the HDMI stick receiving more stable signal with zero latency. Wireless HDMI Dongle : Offers perfect experience for Business and Education presentation (transmit PPT, Excel, Word, PDF and pictures from the smartphone, tablet to the HD TV or Beamer, Projector). Car Wireless HDMI Transmitter : Also can be used a Car WiFi Display and a great Travel Partner, just connect it (powered by 5V 2A) to Car HDMI port, transmitting multimedia contents of Smart Phones to the car monitor. Traffic jam time is no longer boring. Good Compatibility and Satisfaction Guarantee: Support Android 4.2.2 and IOS 6.1 above. We do not recommend using it with Windows system! And our fan-favorite 6-month warranty and friendly customer service.